Oktoberfest München. Somewhere imprinted in the mind of many a beer drinker, this festival represents the ultimate celebration of beer…and of lederhosen. And actually it’s that latter part that is the most discomforting for the average American beer drinker. It’s pretty damn hard to look manly in lederhosen. Maybe if you’ve got body hair like a sasquatch you could pull off the look without disrespecting your manhood, but I digress…. The first thing that you have to realize about Oktoberfest is that the beer is crap. The time for practice is over..it’s time to pack your kit and start the WordDrinkingTour.com European Tour 2012! As usual, to wet the appetite, we’ve prepared a special taster issue of GTG Downtime which we hope will provide inspiration and motivation to all the team! Only 30 days to go.. 30 days until the event of the year: the WorldDrinkingTour.com European Tour 2012 (Munich-Dusseldorf-Amsterdam-Brussels) and anybody taking part in that arduous mission knows it’s vital to be in peek form. That means dedication. Commitment. Above all, training! So we decided it would be prudent to hold a warm up event. A practice run (but definitely not a dry run – Ed) to get our minds and bodies into condition for the main event. And where better than London, with it’s new tradition of sporting success, efficient transportation (taxis), and dozens of world-class training facilities (bars)? Cancel your plans. Drop everything. Whatever it is on your schedule, you can always do it later. Do you not understand how to procrastinate? Wikipedia defines procrastination as the act of replacing high-priority actions with tasks of lower priority, or doing something from which one derives enjoyment, and thus putting off important tasks to a later time. So maybe it’s not procrastination after all. Let’s just say that you will derive enjoyment from a visit to The Kernel. But who is to say that such enjoyment should not be your priority? You owe it to yourself … you’ve earned it … what would the Kernel do? Saturday, you need to reward yourself with a visit to The Kernel Brewery in Bermondsey. 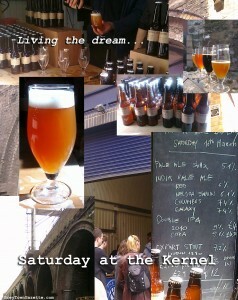 The Kernel was undoubtedly the highlight of last weekend’s WDT London Spring Beer Weekend 2012. Their single hop series of IPAs and double IPAs are outstanding. Bottle aged, with an impressive yeast sediment, these beers have more depth and body than your typical IPA. And consider this this comment is coming from a fan of US west coast IPAs such as Stone, Sculpin and Green Flash … not to mention the Pizza Port brewpubs. The focus on a single hop series of bottle conditioned beers certainly draws comparisons to Mikkeller. The Mikkeller series is great, but while The Kernel does not have nearly as broad of a range (yet), to me they have more of a small batch charm. During our visit to the Kernel (and other bars that served Kernel beers), we enjoyed their Columbus (taste is more upfront, the GTG says it’s “A shot of malty vanilla followed by a baseball bat of hops”), Galaxy (more of a slow burn on the back of the throat), Nelson Sauvin (fruitier, almost like a hint of white grape), and Chinook (similar to Nelson, but lighter). We also enjoyed stronger double IPAs … the double Citra was like sunshine in a bottle, bright and excellently balanced … a 9.8% strength beer full of flavour … maybe a hint of lemon, vanilla, peach … or quite possibly active nuclear fission, as it seemed to have the power of the sun … and I’ve never tasted nuclear fission before so it’s hard to compare … so let’s just call it brilliant … and glowing. The aged double Centennial was also excellent, if not quite as memorable (or glowing) as the Citra, although it did have quite the yeasty sediment. They also had an Export Stout available … smoky and rich … would probably go quite well with the sausages and cheeses available in the market area around The Kernel. However, after the IPAs, it is hard to switch gears to the stout. In a few weeks time (March 31), The Kernel will be moving to a new location several blocks away. Presently they are about equidistant from London Bridge and Bermondsey tube stops (10 minute walk or so), but the new location looks closer to Bermondsey. If for some reason you can’t make it out midday Saturday (it is a rather long journey for some of us), try their beers at the Euston Tap (an excellent bar right outside Euston Station) or the Cask Pub & Kitchen in Pimlico. This weekend, the World Drinking Tour is teaming up with The Grey Town Gazette for a London pub crawl/economic stimulus program. Enjoy this taster note for one of the weekend’s featured beverages, which was originally published in the GTG. Be sure click the “More” button for more from the GTG! I’ve got to hand it to the folks at Coast Brewing Company. They know how to throw a beer festival. Yes, the lines were too long … we waited in line for somewhere between 30 and 45 minutes to get in … and some of the lines at particular brewery tents were just way too long. But what made up for all that was the number of unique and quality beers available. This is not your typical beer festival, where craft brewers trot out their core product line. The allure of this festival is that brewers tend to bring their more unique and experimental offerings. To give you an idea, I’m including my beer log from Brewvival 2012. Weyerbacher Riserva was an outstanding sour American Wild Ale … it reminded me a lot of Oerbier Reserve. Stone’s Imperial Russian Stout Aged in Bourbon Barrels was delicious, particularly on such a cold windy day. Funky Buddha’s No Crusts sounded disgusting (liquid peanut butter and jelly), but was delicious. Holy City’s Imperial Pilsner and Bacon Porter were both fantastic. I was also reminded of how much I like Foothills Sexual Chocolate … I wish they had better distribution in my area.